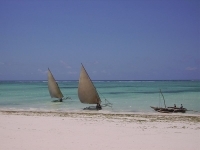 Located about 22 miles (35km) off the east coast of Tanzania, Zanzibar is an archipelago consisting of the main island of Unguja (commonly known as Zanzibar), Pemba Island, famous for its deep-sea fishing, and about 50 smaller surrounding islands and coral reefs. Also known as the 'Spice Islands', Zanzibar evokes images of an exotic paradise with white palm-fringed beaches and turquoise coves, dreamy dhows with billowing white sails, and ancient Islamic ruins. Today's idyllic beach resorts belie the island's haunting history of slavery, and Zanzibar combines Arabic alleyways and historic monuments with coral reefs and excellent diving and snorkelling opportunities. The island's varied history brought with it seafarers, explorers, and traders, and it became a major centre for the slave industry. Its heyday was during the 19th century, when the island became the world's leading producer of cloves; its plantations still produce more than 50 different spices and fruit, and guided spice tours are a Zanzibar speciality. Stone Town, the historic centre of Zanzibar's capital city, is a captivating place built by Arab and Indian merchants in the 19th century from the island's coral stone. A walk through the disordered twisting alleys, past intricately-carved wooden doors and beneath ornate balconies, takes one back in time to the days of a prosperous spice industry. Decaying architecture, numerous mosques, a bathhouse and old fort, cool interior courtyards, and lively markets are the remaining influence of the Persians and the Omani Arabs who established themselves as the ruling power here. For centuries, Zanzibar has enticed those in search of business; today it remains an irresistible attraction for those seeking a heavenly beach holiday or an exploration into its exotic heritage - or a bit of both.